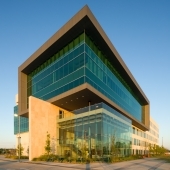 Franks International is a 5-level, 174,000-sf corporate headquarters for a global oil services company based in Lafayette, LA. Our task was to create a core and shell condition with the anticipation of interior design intent to be provided by the client at a later date. Thus, the challenge we had was creating specificity for the company controlling only a part of the variables. So we proposed an outside-in process. By strategizing the façade with architectural hierarchies and interstitial spaces that blurred the boundaries between interior and exterior, we were able to inform the unknown future of the building’s interior. We assigned a different architecture, varying in levels of transparency, to each unique department. A composition of punched openings applied to the south and west faces overlook the industrial facility. 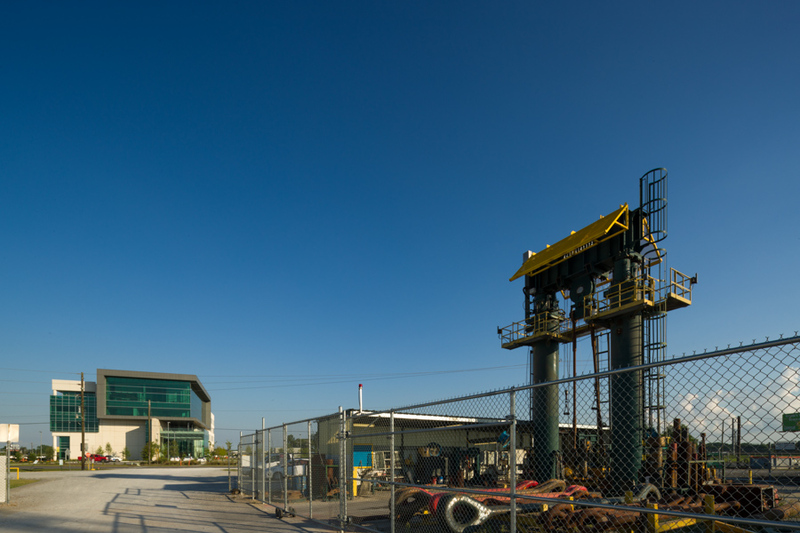 This area is intended for technicians administering various operations around the site. 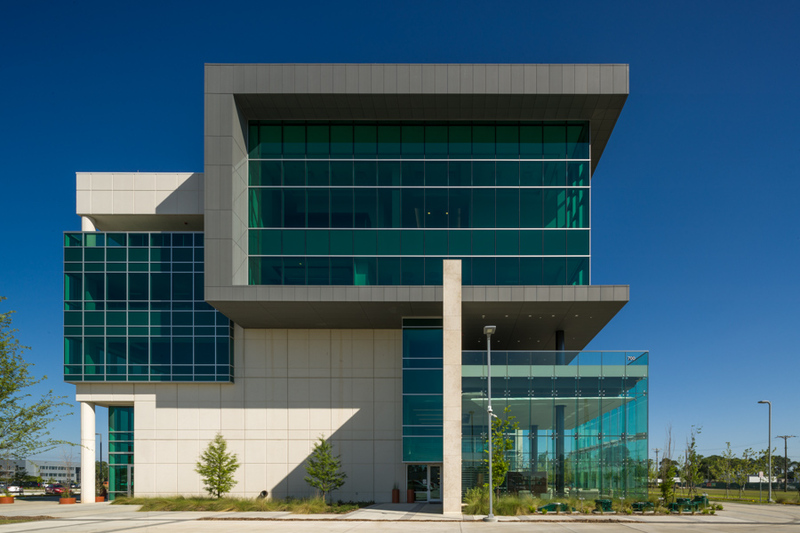 A curtain wall system with vertical fins diffusing west light intended for sales and marketing use faces outward, presenting a dominantly glass facade to the public side of the facility. We used a beyond the wall approach as a device for separating visitors from operational uses. A two-level triple-height zinc and curtain wall volume shelters a terrace over the glass box offering panoramic views of the site. This element is intended to sponsor a conference center and spans both sides of the wall. 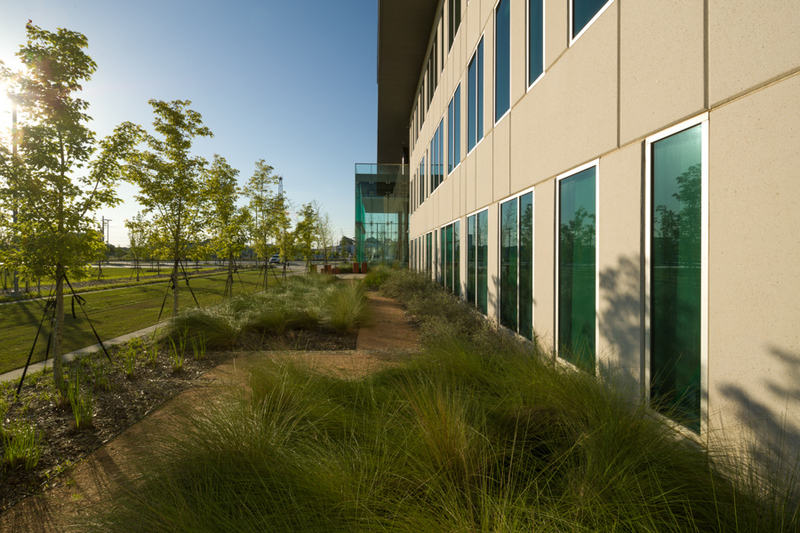 We infused each skin strategy with exterior spaces nested within the building’s massing at each level to provide access to air and light while encouraging collaboration between employees. The project is LEED Silver Certified.